Arun Kamboj - Rashtriya Lok Dal (RLD) Candidate from Saharanpur Seat. Sh. 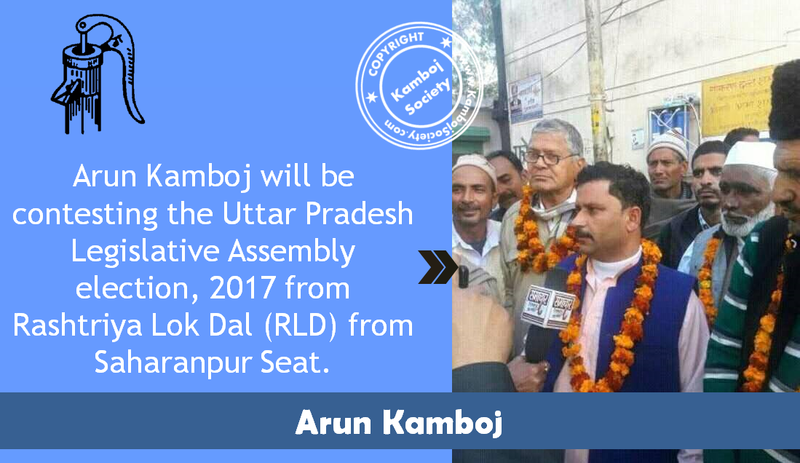 Arun Kamboj will be contesting the Uttar Pradesh Legislative Assembly Election 2017 from Rashtriya Lok Dal (RLD) from Saharanpur Seat. Rashtriya Lok Dal (abbreviated as RLD) (translation: National People's Party) is a political party in India. Chaudhary Ajit Singh is a founder and the president of the party. He is carrying on the political legacy of his father and former Prime Minister of India, Charan Singh and the original Lok Dal. NOTE: KambojSociety.com never support any political party or political candidate. We are only sharing the information regarding the political candidate from Kamboj community.